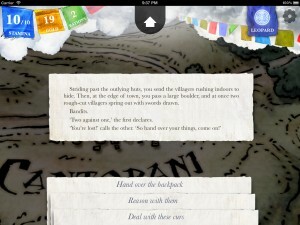 inkle blog - For those of you playing Sorcery!.. For those of you playing Sorcery!.. Speaking of finishing, it looks from our database that the game has been completed over two and half thousand times, with several of those play-throughs by people playing two or more times through. We've had a great response to the game as well, with 80% of our reviews 5-star on the App Store worldwide. Most of the lower reviews either look to the price - $5 is high for the App Store - or the length of the game; and it's true that if you simply aim to survive the story, it can be done pretty fast - missing of the content along the way, of course. If you're looking for a bit more challenge, here's a carrot - the current best number of Gold Pieces to finish with that we've heard of is 54. Can you do better? Also, have you managed to complete the game without fighting the Manticore at all? Have you saved the Plague Village? Have you found the jewel-studded collar, or the Borrinskin boots? Have you made it through the Black Lotus? And have you heard of Vik? ...and if you have played, please add your own on the App Store!